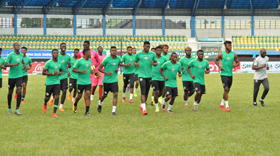 Nigeria U23s held their final training session on Sunday evening ahead of tomorrow's crucial 2019 Africa U23 Cup of Nations qualifier against Libya at the Stephen Keshi Stadium in Asaba, allnigeriasoccer.com reports. The training was delayed for some minutes as the North Africans also had to make use of the turf. The Dream Team VII players and officials swung into action immediately the floodlights were switched on, with the players split into four groups : goalkeepers, defenders, midfielder and strikers. The tactical work involved the fullbacks switching to the other side, strikers practicing penalty kicks, while the wingers focused on their deliveries and the center forward's ability to convert such crosses into goals. Super Eagles manager Gernot Rohr was at the Stephen Keshi Stadium and watched from the stands as the Dream Team VII trained. It is looking likely that Francis Uzoho, who was drafted into the Olympic Team on Saturday, will make his U23 debut on Monday as he played for the Team A in the scrimmage while Olawale Oremade joined the Team B.
Wolfsburg loanee Victor Osimhen could lead the attack against Libya flanked by Samuel Chukwueze as both players were part of the Team A in the final workout.